Hi-de-Hi! star Su Pollard confronted Mrs May at a Downing Street drinks party over her Brexit strategy. 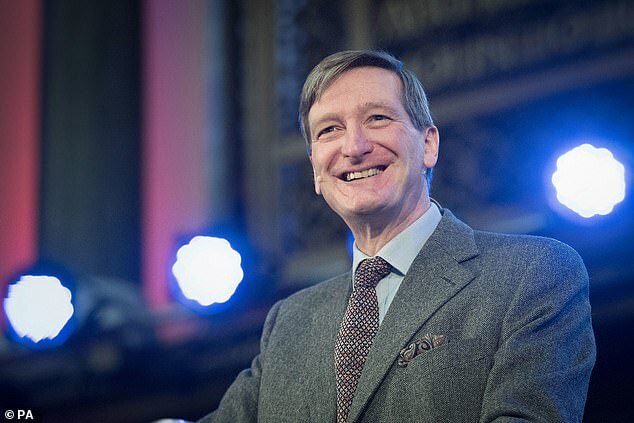 On Tuesday, Dominic Grieve tables his amendment which would force the PM to set out within three sitting days what she will do next if the meaningful vote doesn’t pass this week. His aim is to empower MPs to tell the Government what they want to happen over Brexit. Later that day, Mr Grieve visits Speaker John Bercow in his grace-and-favour Commons apartment. On Wednesday, Mr Bercow causes uproar by calling the amendment, despite aides telling him it goes against constitutional precedent. Mr Bercow’s decision to allow the amendment also caused an angry row with the Government’s Chief Whip Julian Smith. Mr Bercow responded by saying that he would not be ‘bullied’ by Mr Smith. Mr Grieve’s local opponents talk openly about him ‘retiring’ to his holiday home in Brittany. The spacious modern house is situated five minutes outside the fishing village of Lanildut. Neighbour Aude Guillermit said Mr Grieve and his family were there over the Christmas break. ‘I spoke to them and Dominic said that “times were difficult for Britain and the Conservative Party”. Dominic’s mother was French and he is a bilingual English-French speaker. He is equally at ease in either language. 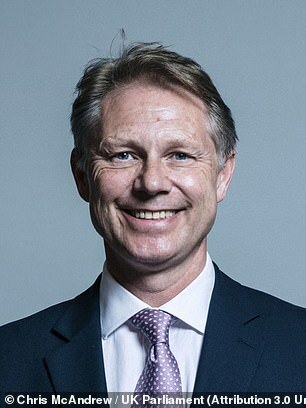 Mr Grieve said he was unaware of any calls by local Beaconsfield Tory association members for him to be deselected over his actions last week and denied that he plans to stand down at the next Election. But she insisted that decisions on amendments were made ‘on the day of the business in question and released or announced that day’. Can we suggest you retire to this petite maison, Monsieur Grieve? The Grieve family bolthole in France is a modern, purpose-built property at odds with its Breton surroundings, but it commands spectacular views across a local estuary. 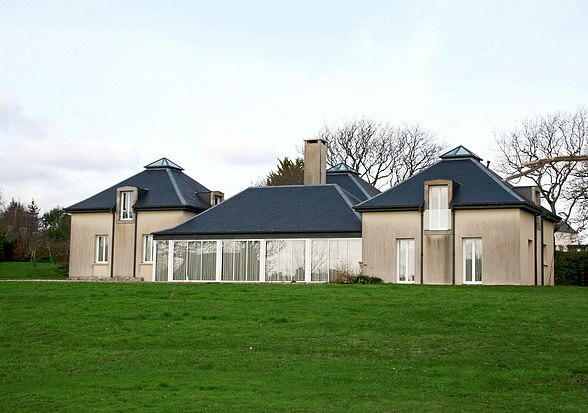 The house, which was completed seven years ago, comprises four buildings joined at the centre, with a glass-fronted section looking out on to a spacious lawn. Neighbours say Mr Grieve is a keen gardener. There are precious few occasions that can ever justify an MP challenging the Commons Speaker. But last week I sadly found myself doing just that. I still believe I was right to do so. ‘Publish it!’ I yelled at John Bercow. I was challenging our Remain-voting Speaker to come clean on what advice he had received from the Commons Clerk before deciding to trash established procedure and allow a Brexit-defying vote to be taken. I felt my rights had been eroded, along with those of my constituents and fellow MPs, whatever their political colour. The Commons had yet to receive a written clarification from Mr Bercow, though he proclaimed he acted in our best interests by granting the amendment tabled by Dominic Grieve. Mr Bercow was flouting time-honoured Commons precedents by creating a ‘one-off’ rule, abandoning constitutional convention and compromising his role as the impartial Speaker. He also ignored expert advice from Commons Clerk Sir David Natzler, who knows these rules intimately. Why? Well, it appears that Mr Bercow wants to do everything he can to thwart the result of the referendum by enabling another humiliating defeat for the Government – without any warning. Mr Bercow denies claims that his car displays a ‘B******s to Brexit’ sticker, saying the vehicle belongs to his wife. But it might as well be stuck firmly to his puffed-up chest on this occasion. The Speaker is there to serve the elected Commons without prejudice. He should not override House business and act as our master. It’s like a cricket umpire who, halfway through the game, invents a new method of dismissal to suit the losing side – especially if the batsman happens to be Theresa May. The Prime Minister is trying to secure a workable Brexit agreement in the full spirit of what the people called for in the referendum. We all know the polarised emotions and debates, but we as a nation voted Leave and that must be honoured and delivered. It is what Mrs May is committed to doing and now is the time for the Speaker to uphold the set procedures of the Commons and not perform a ‘one-off’ to suit himself. His actions have done little to bring the country together and will be catastrophic if they are repeated. This is a man who shed his Right-wing principles as a Tory MP to win the post of Speaker in 2009 largely on the back of Labour votes. 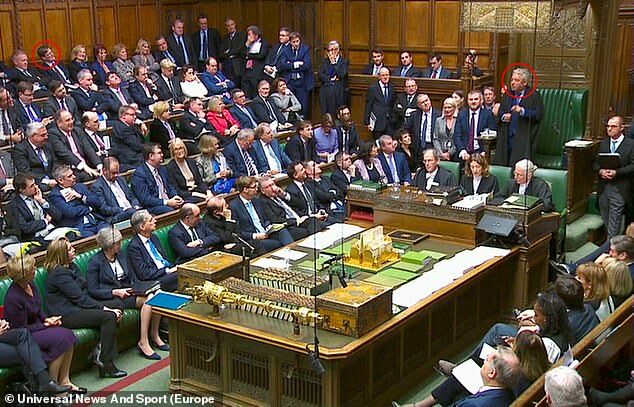 Judging from the cheers from the Opposition benches last week, it appeared he was repaying those Labour votes. By tradition, Speakers give up their party affiliation to serve the whole House. At this important time for the nation, he should not only be apolitical, but also bring the MPs together. Mr Bercow indicated in 2009 that he would serve for nine years. His self-imposed time has expired. Most of my colleagues feel he has betrayed his historic office and that the Prime Minister should deny him the traditional peerage offered to retiring Speakers. He can hardly object to breaking precedent after lecturing us last week that if past practice was never overturned, nothing would ever change. By those same standards of creating a ‘one-off’, if Mr Bercow should again seek to stand as MP for Buckingham, he should be denied the traditional sitting Speaker’s privilege of not facing candidates from the main parties. 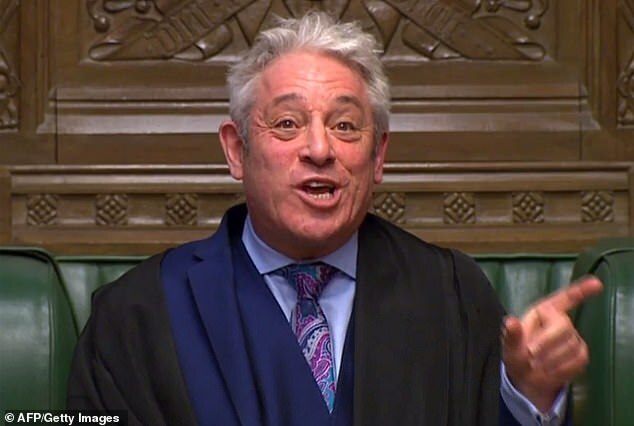 Should Mr Bercow seek to bend the rules again this week to appear to serve his own or the Opposition’s agenda, I will have no hesitation in standing up and protesting in the strongest manner. I swore to uphold the wishes of my community and the people of our nation; a repeat of the Speaker’s actions will be seen as violation of my constituents’ rights. But this time I suspect many Tory colleagues will stand with me to uphold our precious democracy and honour the interests of the people who voted for Brexit. John Bercow faces the threat of a mass protest by Tory MPs if he repeats his ‘abuse of authority’ at this week’s crucial Brexit debate. The Speaker was warned that more than 100 MPs would stand up to oppose him in a demonstration of ‘mass defiance’ of his authority. Tory MPs also said that Mr Bercow should be denied the Speaker’s traditional peerage on retirement if he once again ‘bent’ time-honoured Commons rules. 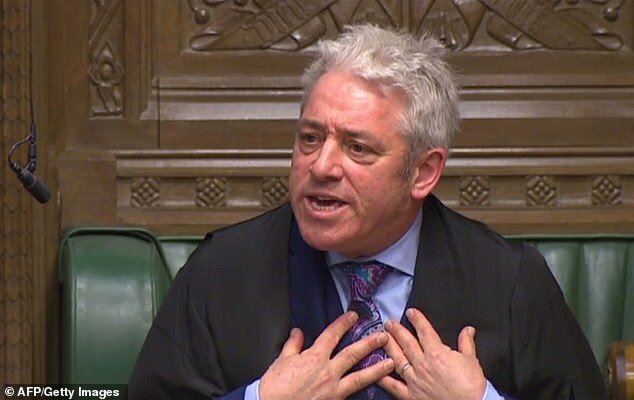 Mr Bercow sparked extraordinary protests in the Commons last week when he was accused of shredding parliamentary procedure to allow a vote designed to tie Theresa May’s hands over Brexit. Amid furious scenes, the Speaker faced repeated accusations that he had ignored expert advice from the Commons Clerk, Sir David Natzler, to allow the vote to go ahead. The Government subsequent lost the vote. Tory MPs are now threatening even stronger action if Mr Bercow repeats the tactics during this week’s vital final debates and vote on the Prime Minister’s Brexit deal. Sources said more than 100 were ready to stand up ‘en masse’ to protest if Mr Bercow shows what they called ‘blatant bias’ against the Government. The threat raises the prospect of the entire debate having to be suspended. 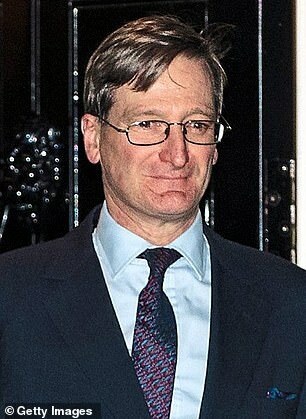 Mr Morris, who last week stood and challenged Mr Bercow to publish the advice of Commons clerks that he was overriding, said he was ready to take part in the protest. Mr Morris compared him to a ‘cricket umpire, who halfway through the game, invents a new method of dismissal to suit the losing side’. Remain voter Mr Bercow has insisted that he had behaved entirely properly and had always been ‘scrupulously fair to Brexiteers and Remainers alike’.